Our volunteers know how to have a good time and Volunteer Appreciation Night on January 29th was no exception. The shop was abuzz with friendly conversations and laughter as volunteers caught up with old friends and made new ones. The passion and sense of community volunteers bring to our shop and programs is inspiring. Last year 873 volunteers gave a total of 11,324 hours of their time with our programs, shop projects, and community outreach events. Over 60 volunteers gave more than 30 hours in 2012, while 22 contributed over 100 hours! Over the course of the evening, we recognized volunteers for their extraordinary contributions in 2012 with Golden Bike Awards, which come in the form of tiny bike parts, spray-painted gold. 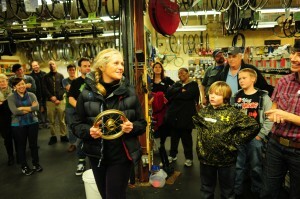 The crowd cheered as the Cycle Oregon team, which raised a record $32,000, received golden toothbrushes. Program assistants (volunteers who assist staff with our community programs like Bike Club, Bike Camp, and Create a Commuter) took home golden training wheels, chain guards and tire levers in recognition of their staggering 727 hours of support. Charles Edelson, one of our talented volunteer photographers, snapped photos of the night – check them out on Facebook or in the slideshow below. Our volunteers are amazing and their generous contributions of time and skill allow us to reach our community in new ways each year. If you are interested in volunteering at the Community Cycling Center, the next orientation is Tuesday, March 5th. RSVPs are required – click here for more information.